Hailu Mergia wants you to know: He was always ready to return the spotlight. He was just waiting for someone to ask. And now that they have — now that a series of people have, actually — the 71-year-old keyboardist’s return is ready to evolve from rediscovered curiosity to full-blown real-life comeback, highlighted by the release of Lala Belu, Mergia’s first album of new material in two decades. To fully appreciate this stage of his career, though, you have to know Mergia’s story. It’s now relatively well-known: He spent the first half of his life in his native Ethiopia, playing keyboard in the Wailas Band, a popular Addis Ababa-based jazz and funk ensemble that, in 1981, became the first modern Ethiopian band to tour America. During that tour, Mergia and three of his band mates decided to remain stateside rather than return to Ethiopia, then wracked by famine and ruled by the Derg dictatorship. Mergia settled in the Washington D.C. area, started driving a taxi and stopped playing music professionally, choosing instead to cart around his keyboard in the trunk of his cab and practice when passengers were scarce. That’s where Mergia’s musical story seemed to end, until a few years ago when he heard from Brian Shimkovitz, an American who carved himself a niche online by highlighting obscure African music on his website, Awesome Tapes from Africa. Shimkovitz had converted his hobby into a record label and wanted to reissue Mergia’s 1985 one-man-band classic Shemonmuanaye. Reissued as Hailu Mergia & His Classical Instrument: Shemonmuanaye, the album finds its namesake in exploratory mode, fusing accordion, Rhodes piano and modern synthesizers with traditional melodies of Ethiopia. The result is a set of songs that are warm and woozy, relaxed, low-key funky and strangely beautiful. The release sparked wider interest in Mergia’s music, prompting the artist to start playing out again, most often with D.C. drummer Tony Buck and bassist Mike Majkowski. Awesome Tapes has since reissued two more archival releases: the 1977 Wailas Band album Tche Belew and Mergia’s 1978 collaboration with the Dahlak Band called Wede Harer Guzo. Which brings us back to Lala Belu, a six-track album featuring three traditional Ethiopian songs, three Mergia originals and a jazzier, more upbeat sound than Shemonmuanaye, thanks largely to the rhythm section of Buck and Majkowski. But the album still sizzles with Mergia’s inspired, roaming sound. AD caught up with Mergia at his Fort Washington, Maryland home, where he spoke by phone about Lala Belu, driving a taxi and keeping his musical skills sharp. Aquarium Drunkard: Do you ever go back to Ethiopia? Hailu Mergia: Since 2010 I go almost every year, just for vacation. AD: When you go, do you get recognized as a famous musician? Or are you able to keep a low profile? 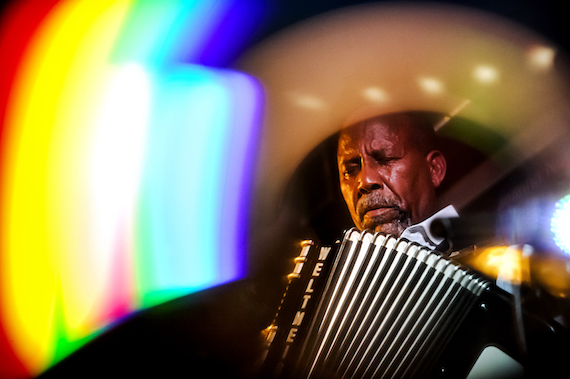 Hailu Mergia: A little bit of both, but I never perform when I go there. I just go for relaxation and at the same time to visit friends and some family. AD: It’s been about five years since the reissue of Shemonmuanaye by Awesome Tapes from Africa. Is it fair to say that the reaction to that record provided you a path back to playing music professionally? Hailu Mergia: What you said is true. That album, when I originally released it in 1985, it was very popular in the Ethiopian community and in Ethiopia. But now when Brian (Shimkovitz) released it, it’s really amazing the people out there that like it and the market for it. AD: Can you tell me a little bit about the music on Lala Belu? How is it reflective of your current interests? Hailu Mergia: I think it has a mix of sounds. There are some sounds that are like the Shemonmuanaye album. And it also has a more acoustic sound and acoustic piano, which is a new kind of recording for me. And then there is also the same kind of sounds as on the Dahlak Band album Wede Harer Guzo. So there’s a combination of synthesizer, Rhodes piano, acoustic piano, melodica and accordion, and some singing and a choir. It’s a mixture of sounds and that’s what makes it different from all the other things I did before. AD: Going into the sessions for Lala Belu, did you have an idea of what kind of record you wanted to make? Hailu Mergia: Honestly, from the beginning, I never think of all the details like that. The main idea is since I started playing again in 2013, people have been asking us to have some kind of new album. So that’s the main reason we did this with my drummer and bass player, Tony and Mike. We recorded the original tracks in London and then the rest of the mix, I did here. So we just wanted to have a new album since I came back. It’s like a “welcome back” album. AD: You recorded Shemonmuanaye on your own, whereas Lala Belu is a trio record. What, if anything, have you learned from Tony and Mike? Hailu Mergia: I’ve learned a lot from them because when you play with a trio everything has to be clear. The sound, everything has to be clear. So the music that I send to them … they practice it before I even get there. They practice it like I am there even though I am not. These guys are very energetic guys and very talented, and I appreciate how much work they put into the whole thing. Actually, they are the ones who pushed us to make this album. They gave me the energy to do it. AD: Speaking of energy, I think Shemonmuanaye feels like a late-night afterparty record, whereas Lala Belu sounds more like it was made for the party itself. Do you agree? Hailu Mergia: Like you said, the music sounds very different. It’s true, this one is more groovy and energetic, because the show … we never play the slow music. AD: Ah, so Lala Belu is heavily influenced by your live set? Hailu Mergia: Oh yes, we recorded this how we play for the show. AD: You famously drove a taxi for years before the resurgence in your music career. Are you still driving? Hailu Mergia: I don’t drive like I used to because now I’m now giving more time to the music for rehearsal with the group. So I drive part-time. I don’t know about the future. AD: How else has your life changed since the re-release of Shemonmuanaye? AD: It must be so gratifying to have your music career back in a place where you can focus more on it than a day job. It’s been decades! Hailu Mergia: Well, I stopped playing for the public in 1991, but since then, even when I was driving taxi, I was not out of the music. I was practicing in my house and in my car. Everywhere I go, I still have the music inside of me. AD: Fair enough, but even practicing in the back of your taxi, could you ever have imagined a time when you’d be releasing new music worldwide and touring again? Hailu Mergia: One day I imagined it would come back. That’s why I was practicing. That’s why I didn’t drop the music. I have my own reason why I stopped playing music in the club, but after that I practiced … because let’s say people know me — especially some in the Ethiopian community and some outside, too — if somebody asked me to play for some occasion, I have to be able to play. If I’m not practicing, I cannot make it. I was not expecting this, but I was expecting I might be asked to play one day somewhere, so I have to practice not only for that but also for my career. So it’s a little bit of everything and because I cannot live without music. AD: Ultimately, what do you hope people will take away from Lala Belu?